With crops being planted in the field, now is a good time to refresh our knowledge of on-farm diagnostics to try to stay ahead of problems. Diagnosing on farm issues requires us to know what normal, healthy crops look like, and to observe in field clues. Crop health can be impacted by both biotic and abiotic disorders. Biotic disorders are caused by living organisms (fungi, nematodes, bacteria, viruses) while abiotic disorders are caused by non-living organisms. 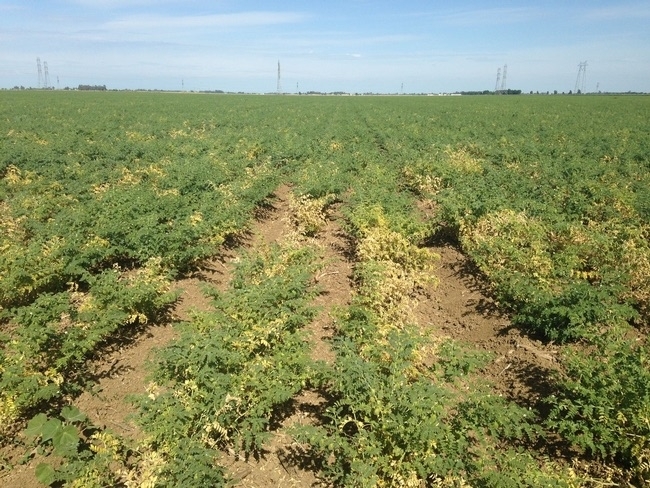 This includes things like herbicide damage, environmental factors (water and heat stress), nutrient deficiencies or toxicities, mechanical damage, and soil salinity issues. Biotic and abiotic disorders are managed differently and accurate diagnosis is important for effective management. To differentiate between biotic and abiotic disorders, look for patterns in the field. Some abiotic problems, like nutrient deficiency or herbicide damage, tend to be uniformly spread across the field. Others might be more concentrated in certain areas of the field. For instance, herbicide drift from a neighboring field tends to affect plants on the edge of roadways or field borders, and whole rows or sets of rows are affected if there is an irrigation problem leading to too much or too little water. In contrast, biotic disorders tend to be patchily distributed—although this is not always the case, this is a good rule of thumb for determining whether you might have a biotic disease issue. Take a look at a normal, healthy crop to help identify what the issue is. Other important factors to note include when and where in the field symptoms occurred, patterns of affected plants in the field (which vary by disease), and any potential spread throughout the field. Sometimes it can be hard to diagnose the issue if plants are too far gone. 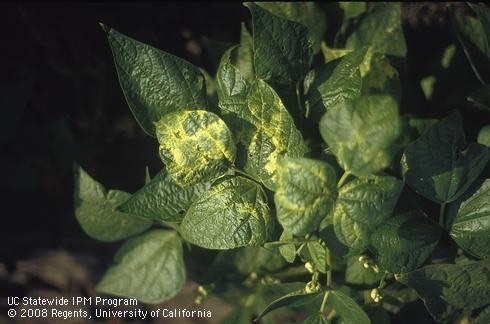 There are excellent guides that you can use to narrow down the main cause of your problem, including information on herbicide damage symptoms that can be found at: http://herbicidesymptoms.ipm.ucanr.edu/?src=sub. We also have great resources at UC Davis for identifying plant diseases and abiotic issues. You can either drop off samples at my office or I'd be glad come out to the field to take a look your crops.